Halloween is this weekend but I am going to jump ahead to Thanksgiving for those of you that want to change out your decor. I loved the watercolor Autumn printable I created and shared a few weeks ago so I wanted to use the same watercolor images to create something you could display for Thanksgiving. These are designed as an 8x10 printable but you can print smaller like I did. Send to a store to get it printed or print from home. Play with your printer settings for it to fit properly, like I did 5x7, shrink to fit. There are also 3 design options available so pick just one or all of them to print! 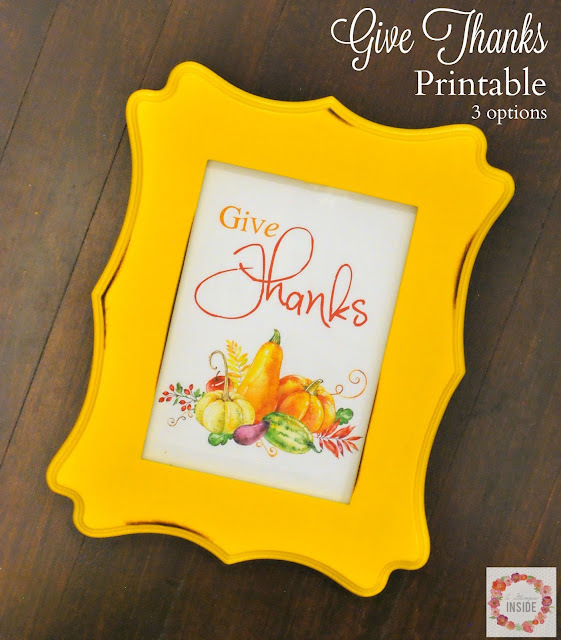 Thank you so much for creating this printable! I have already downloaded and printed these in wallet size on brown cardstock to attach with twine to the pumpkin bread that I make each year for my daughters teachers and support staff! !